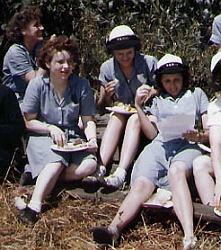 In 1943, a navy blue working uniform for summer was introduced. It had the same design as the woolen winter service uniform (Service Dress, Blue), but was made of cotton gabardine. A white, short-sleeved, cotton gabardine shirtwaist was worn with the summer blue uniform. Enlisted women wore their rating marks on the sleeves of these shirts. Officers wore collar insignia on the shirt. Removal of the suit jackets while working was permissible. 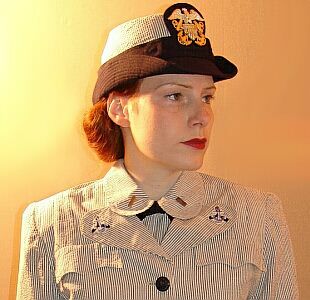 The WAVES working uniform was made of gray and white pinstriped cotton seersucker fabric. It consisted of a shirtwaist dress with matching jacket. (Enlisted Personnel) ... The shirtwaist of the dress had a fly front, set-in belt and short sleeves. The rounded collar was worn closed at the neck and with the black tie. The skirt had a front kick pleat. Enlisted personnel wore a rating badge on the left sleeve (if qualified). The matching jacket had a four button front, long sleeves, two upper and two side pocket flaps. The jacket had round lapels and the dress collar was worn over the jacket. The jacket worn by officers was closed with four blue plastic Navy buttons like the jackets for enlisted personnel. *. sleeve markings (stripes) indicating the rank of the wearer. Additionally, officers of designated corps wore a corps device above their sleeve markings. Working Smock, Reserve Blue . The reserve blue working smock was made of plain cotton or rayon material. It had a wrap front tied at the waist on the inside at the right, and on the outside at the left. 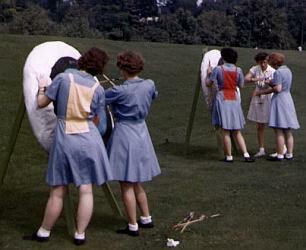 The short sleeved frock was buttoned below the waist with a single row of navy blue plastic buttons. The peaked lapels were overlaid by the ends of the rounded collar. The working smock had one pocket below the waistline. ...... Another variant of smock was also permitted. It was made of the same material and color, but had long set-in sleeves, a full tie belt and a double-breasted front with a double row of three navy blue plastic buttons. 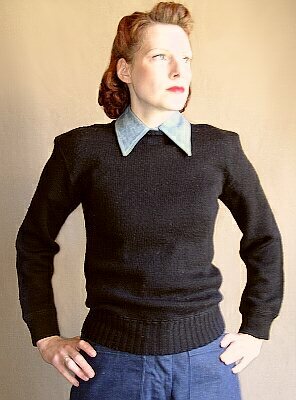 The collar had rounded ends and peaked lapels. Qualified enlisted personnel wore a rating badge on the left sleeve. In October 1944, officers were permited to wear metal pin-on collar devices on working smocks. W-V(S) officers wore their rank insignia on both sides of the collar, staff officers wore the corps insignia on the left side of the working smock collar and the rank device on the right side. The insignia had to be centered on the collar one inch from the front edge. .
.v The one-piece aviation coverall was made of cotton material in a medium blue color shade. 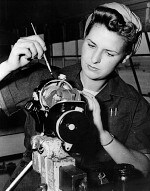 It was similar to the coveralls worn by all aviation mechanics. 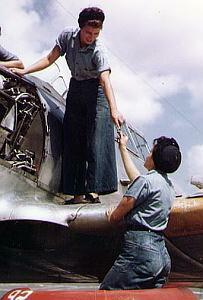 The aviation coverall had long sleeves, a buttoned front and a rounded Peter Pan collar. The coverall was equipped with a self-fabric belt that was worn knotted at the center of the front. The coverall had two plain upper pockets plus a pencil pocket on the right side and two large patch pockets below the waistband. The long trouser legs had tabs to adjust width at the bottom. The coverall should be worn with a turban-type head covering and navy blue socks. However, on many pictures one can see that white socks were used as well. 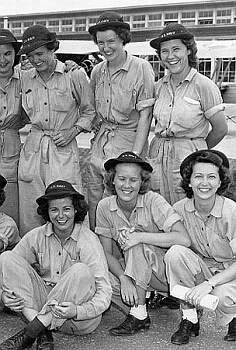 During 1944, navy blue denim slacks and blue cotton chambray shirts eventually replaced the aviation coverall. Wearing of the regulation men's dungaree trousers and chambray shirt was optional. 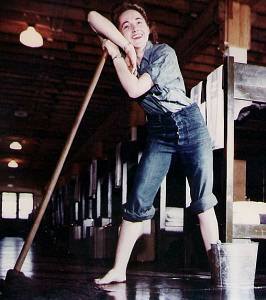 Navy WAVE trainee wearing the newly authorized denim slacks and blue shirt while cleaning her barracks in 1944.
. For extra warmth, a black knitted men's sweater with turtleneck could be worn. The picture on the right below shows the same sweater type with turtleneck removed. 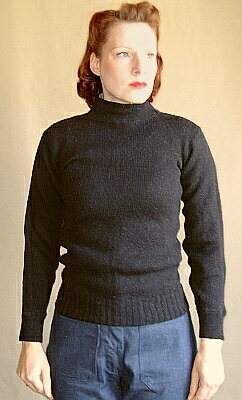 Probably, it was removed for more comfort when the sweater was worn with a shirt underneath. 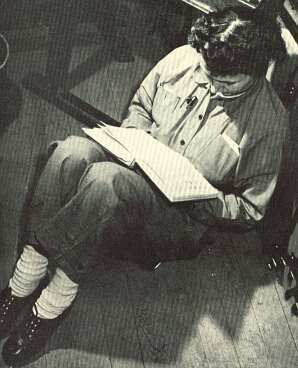 The exercise suit, authorized in late 1944, was worn for gymnasium classes and could be worn for any physical exercise. It consisted of light blue denim shorts and matching skirt, to be worn with a long or short-sleeved shirt and blue or white ankle socks. Other exercise suits which had been authorized by local Commanding Officers could be worn until the present supply was exhausted or those in possession were no longer serviceable. The exercise suit was not available in the stores for several months after approvement of this new garment. WAVES in exercise suits training archery.